Thermal biology predicts that vector-borne disease transmission peaks at intermediate temperatures and declines at high and low temperatures. However, thermal optima and limits remain unknown for most vector-borne pathogens. We built a mechanistic model for the thermal response of Ross River virus, an important mosquito-borne pathogen in Australia, Pacific Islands, and potentially at risk of emerging worldwide. Transmission peaks at moderate temperatures (26.4°C) and declines to zero at thermal limits (17.0 and 31.5°C). The model accurately predicts that transmission is year-round endemic in the tropics but seasonal in temperate areas, resulting in the nationwide seasonal peak in human cases. Climate warming will likely increase transmission in temperate areas (where most Australians live) but decrease transmission in tropical areas where mean temperatures are already near the thermal optimum. These results illustrate the importance of nonlinear models for inferring the role of temperature in disease dynamics and predicting responses to climate change. Mosquitoes cannot control their body temperature, so their survival and performance depend on the temperature where they live. As a result, outside temperatures can also affect the spread of diseases transmitted by mosquitoes. This has left scientists wondering how climate change may affect the spread of mosquito-borne diseases. Predicting the effects of climate change on such diseases is tricky, because many interacting factors, including temperatures and rainfall, affect mosquito populations. Also, rising temperatures do not always have a positive effect on mosquitoes – they may help mosquitoes initially, but it can get too warm even for these animals. Climate change could affect the Ross River virus, the most common mosquito-borne disease in Australia. The virus infects 2,000 to 9,000 people each year and can cause long-term joint pain and disability. Currently, the virus spreads year-round in tropical, northern Australia and seasonally in temperate, southern Australia. Large outbreaks have occurred outside of Australia, and scientists are worried it could spread worldwide. Now, Shocket et al. have built a model that predicts how the spread of Ross River virus changes with temperature. Shocket et al. used data from laboratory experiments that measured mosquito and virus performance across a broad range of temperatures. The experiments showed that ~26°C (80°F) is the optimal temperature for mosquitoes to spread the Ross River virus. Temperatures below 17°C (63°F) and above 32°C (89°F) hamper the spread of the virus. These temperature ranges match the current disease patterns in Australia where human cases peak in March. This is two months after the country’s average temperature reaches the optimal level and about how long it takes mosquito populations to grow, infect people, and for symptoms to develop. Because northern Australia is already near the optimal temperature for mosquitos to spread the Ross River virus, any climate warming should decrease transmission there. But warming temperatures could increase the disease’s transmission in the southern part of the country, where most people live. The model Shocket et al. created may help the Australian government and mosquito control agencies better plan for the future. Temperature impacts the transmission of mosquito-borne diseases via effects on the physiology of mosquitoes and pathogens. Transmission requires that mosquitoes be abundant, bite a host and ingest an infectious bloodmeal, survive long enough for pathogen development and within-host migration (the extrinsic incubation period), and bite additional hosts—all processes that depend on temperature (Mordecai et al., 2013, Mordecai et al., 2017). Although both mechanistic (Mordecai et al., 2013, Mordecai et al., 2017; Liu-Helmersson et al., 2014; Wesolowski et al., 2015; Paull et al., 2017) and statistical models (Perkins et al., 2015; Siraj et al., 2015; Paull et al., 2017; Peña-García et al., 2017) support the impact of temperature on mosquito-borne disease, important knowledge gaps remain. First, how the impact of temperature on transmission differs across diseases, via what mechanisms, and the types of data needed to characterize these differences all remain uncertain. Second, the impacts of temperature on transmission can appear idiosyncratic—varying in both magnitude and direction—across locations and studies (Gatton et al., 2005; Jacups et al., 2008a; Stewart-Ibarra and Lowe, 2013; Peña-García et al., 2017; Koolhof et al., 2017). Although inferring causality from field observations and statistical approaches alone remains challenging, nonlinear thermal biology may mechanistically explain this variation. As the climate changes, filling these gaps becomes increasingly important for predicting geographic, seasonal, and interannual variation in transmission of mosquito-borne pathogens. Here, we address these gaps by building a model for temperature-dependent transmission of Ross River virus (RRV), the most important mosquito-borne disease in Australia (1500–9500 human cases per year) (Koolhof et al., 2017), and potentially at risk of emerging worldwide (Flies et al., 2018). RRV in Australia is an ideal case study for examining the influence of temperature. Transmission occurs across a wide latitudinal gradient, where climate varies substantially both geographically and seasonally. Moreover, compared to vector-borne diseases in lower-income settings, RRV case diagnosis and reporting are more accurate and consistent, and variation in socioeconomic conditions (and therefore housing and vector control efforts) at regional and continental scales is relatively low. Previous work has shown that in some settings temperature predicts RRV cases (Gatton et al., 2005; Bi et al., 2009; Werner et al., 2012; Koolhof et al., 2017), while in others it does not (Hu et al., 2004; Gatton et al., 2005). Understanding RRV transmission ecology is critical because the virus is a candidate for emergence worldwide (Flies et al., 2018), and has caused explosive epidemics where it has emerged in the past (infecting over 500,000 people in a 1979–80 epidemic in Fiji) (Klapsing et al., 2005). RRV is a significant public health burden because infection causes joint pain that can become chronic and cause disability (Harley et al., 2001; Koolhof et al., 2017). A mechanistic model for temperature-dependent transmission could help explain these disparate results and predict potential expansion. Mechanistic models synthesize how environmental factors like temperature influence host and parasite traits that drive transmission. Thermal responses of ectotherm traits are usually unimodal: they peak at intermediate temperatures and decline towards zero at lower and upper thermal limits, all of which vary across traits (Dell et al., 2011; Mordecai et al., 2013; Mordecai et al., 2017). Mechanistic models are particularly useful for synthesizing the effects of multiple, nonlinear thermal responses that shape transmission (Rogers and Randolph, 2006; Mordecai et al., 2013). One commonly used measure of disease spread is R0, the basic reproductive number, defined as the number of secondary cases expected from a single case in a fully susceptible population. Relative R0— R0 scaled between 0 and 1—is a modified metric that captures the thermal response of transmission without making assumptions about other factors that affect the absolute value of R0 (Mordecai et al., 2013, Mordecai et al., 2017). For mosquito-borne disease, R0 is a nonlinear function of mosquito density, biting rate, vector competence (infectiousness given pathogen exposure), and adult survival; pathogen extrinsic incubation period; and human recovery rate (Dietz, 1993). To understand how multiple traits that respond nonlinearly to temperature combine to affect transmission, we incorporate empirically-estimated trait thermal responses into a model of relative R0. Synthesizing the full suite of nonlinear trait responses is critical because such models often make predictions that are drastically different, with transmission optima up to 7°C lower, than models that assume linear or monotonic thermal responses or omit temperature-dependent processes (Mordecai et al., 2013, Mordecai et al., 2017). Previous mechanistic models that incorporated multiple nonlinear trait thermal responses have predicted different optimal temperatures across pathogens and vector species: 25°C for falciparum malaria in Anopheles vectors (Mordecai et al., 2013) and West Nile virus in Culex vectors (Paull et al., 2017), and 29 and 26°C for dengue, chikungunya, and Zika viruses (in Aedes aegypti and Ae. albopictus, respectively) (Liu-Helmersson et al., 2014; Wesolowski et al., 2015; Mordecai et al., 2017). Here, we build the first mechanistic model for temperature-dependent transmission of RRV and ask whether temperature explains seasonal and geographic patterns of disease. We use data from laboratory experiments with two important vector species (Culex annulirostris and Aedes vigilax) to parameterize the model with unimodal thermal responses. We then use sensitivity and uncertainty analyses to determine which traits drive the relationship between temperature and transmission potential and identify key data gaps. Finally, we illustrate how temperature currently shapes patterns of disease transmission across Australia. The model correctly predicts that RRV disease is year-round endemic in tropical, northern Australia with little seasonal variation due to temperature, and seasonally epidemic in temperate, southern Australia. These results provide a mechanistic explanation for idiosyncrasies in RRV temperature responses observed in previous studies (Hu et al., 2004; Gatton et al., 2005; Bi et al., 2009; Werner et al., 2012; Koolhof et al., 2017). A population-weighted version of the model (assuming a two-month lag between temperature and human cases based on mosquito and disease development times) also accurately predicts the seasonality of human cases nationally. Thus, from laboratory data on mosquito and parasite thermal responses alone, this simple model mechanistically explains broad geographic and seasonal patterns of disease. The natural history of RRV is complex: transmission occurs across a range of climates (tropical, subtropical, and temperate) and habitats (urban and rural, coastal and inland) and via many vertebrate reservoir and vector species (Claflin and Webb, 2015). Marsupials are generally considered the critical reservoirs for maintaining the virus between human outbreaks, but recent work has argued that placental mammals and birds may be equally important in many locations (Stephenson et al., 2018). The virus has been isolated from over 40 mosquito species in nature, and 10 species transmit it in laboratory studies (Harley et al., 2001; Russell, 2002). However, four species are responsible for most transmission to humans (Culex annulirostris, Aedes [Ochlerotatus] vigilax, Ae. [O.] notoscriptus, and Ae. [O.] camptorhynchus), with two additional species implicated in outbreaks (Ae. [Stegomyia] polynesiensis and Ae. [O.] normanensis). The vectors differ in climate and habitat niches, leading to geographic variation in associations with outbreaks. We assembled and mapped records of RRV outbreaks in humans attributed to different vector species (Figure 1, Figure 1—source data 1) (Rosen et al., 1981; Campbell et al., 1989; Russell et al., 1991; Yang et al., 2009; Lindsay et al., 1993b; Lindsay et al., 1993a; Lindsay et al., 1996; Lindsay et al., 2007; McManus et al., 1992; Merianos et al., 1992; Whelan et al., 1992; Whelan et al., 1995, Whelan et al., 1997; McDonnell et al., 1994; Russell, 1994; Russell, 2002; Dhileepan, 1996; Ritchie et al., 1997; Brokenshire et al., 2000; Ryan et al., 2000; Harley et al., 2000; Harley et al., 2001; Kelly-Hope et al., 2004a; Frances et al., 2004; Biggs and Mottram, 2008; Jacups et al., 2008b; Schmaedick et al., 2008; Lau et al., 2017). Ae. vigilax and Ae. notoscriptus were more commonly implicated in transmission in tropical and subtropical zones, Ae. camptorhynchus in temperate zones, and Cx. annulirostris throughout all climatic zones. Freshwater-breeding Cx. annulirostris has been implicated in transmission across both inland and coastal areas, while saltmarsh mosquitoes Ae. vigilax and Ae. camptorhynchus have been implicated only in coastal areas (Russell, 2002) and inland areas affected by salinization from agriculture (Biggs and Mottram, 2008; Carver et al., 2009). Peri-domestic, container-breeding Ae. notoscriptus has been implicated in urban epidemics (Russell, 2002). The vectors also differ in their seasonality: Ae. camptorhynchus populations peak earlier and in cooler temperatures than Ae. vigilax, leading to seasonal succession where they overlap (Yang et al., 2009; Russell, 1998). This latitudinal and temporal variation suggests that vector species may have different thermal optima and/or niche breadths. If so, temperature may impact disease transmission differently for each species. Transmission depends on a suite of vector, pathogen, and human traits, including mosquito density (M). Our main model (‘full R0 Model,’ Equation 1) assumes temperature drives mosquito density and includes the relevant life history trait thermal responses (Parham and Michael, 2009; Mordecai et al., 2013; Mordecai et al., 2017). We initially compare this model to an alternative (‘constant M model,’ Equation 2) where mosquito density does not depend on temperature. We make this comparison because many transmission models do not include the thermal responses for mosquito density, assuming it depends primarily on habitat availability. Here, we focus on the relative influence of temperature on transmission potential, recognizing that absolute R0 also depends on other factors. Accordingly, we scaled model output between zero and one (‘relative R0’). Relative R0 describes thermal suitability for transmission. Combined with factors like breeding habitat availability, vector control, humidity, human and reservoir host density, host immune status, and mosquito exposure, relative R0 can be used to predict disease incidence. In this approach, only the relative thermal response of each trait influences R0, which is desirable since traits can differ substantially due to other factors and in laboratory versus field settings (particularly mosquito survival: Clements and Paterson, 1981). Relative R0 does not provide a threshold for sustained disease transmission (i.e. where absolute R0 = 1), since this threshold is not controlled solely by temperature. Instead, relative R0 preserves the temperature-dependence of R0 to provide three key temperature values: upper and lower thermal limits where transmission is possible (R0 >0; a conservative threshold where transmission is not excluded by high or low temperatures) and the temperature that maximizes R0. Vector and pathogen traits that drive transmission consistently responded to temperature (Figure 2), though data were sparse (McDonald et al., 1980; Mottram et al., 1986; Russell, 1986; Rae, 1990; Kay and Jennings, 2002). Although we exhaustively searched for experiments with trait measurements at three or more constant temperatures in the Australian vector species (Cx. annulirostris, Ae. vigilax, Ae. camptorhynchus, Ae. notoscriptus, and Ae. normanensis), no species had data for all necessary traits (Figure 1). Thus, we combined traits from two species to build composite R0 models. We used mosquito life history traits measured in Cx. annulirostris: fecundity (as eggs per female per day, EFD), egg survival (as the proportion of rafts that hatch, pRH, and the number of larvae emerging per viable raft, nLR), the proportion surviving from larvae-to-adulthood (pLA), mosquito development rate (MDR), adult mosquito lifespan (lf), and biting rate (a). We used infection traits measured in Ae. vigilax: vector competence (bc) and parasite development rate (PDR). For comparison, we also fit traits for other mosquito and virus species: MDR and pLA from Ae. camptorhynchus and Ae. notoscriptus, and PDR and bc from Murray Valley encephalitis virus (another important pathogen transmitted by these mosquitoes in Australia) in Cx. annulirostris (Figure 2—figure supplements 2, 3 and 4) (Kay et al., 1989; Barton and Aberton, 2005; Williams and Rau, 2011). We used sensitivity analyses to evaluate the potential impact of this vector mismatch. However, all spatial and temporal predictions of R0 (Figures 5–7) use the full R0 model parameterized with mosquito life history traits from Cx. annulirostris and infection traits from Ae. vigilax (as shown in Figure 2). Thermal optima ranged from 23.4°C for adult lifespan (lf) to 33.0°C for parasite development rate (PDR; Figure 2). The data supported unimodal thermal responses for most traits, though declines at high temperatures were not directly observed for biting rate (a) and parasite development rate. Data from other mosquito species and ectotherm physiology theory imply these traits must decline at very high temperatures, so we used strong priors to make them decline near ~40°C. Because our approach is designed to identify which traits constrain transmission at thermal limits, this choice is conservative since it means R0 will be limited by other traits with better data. Accordingly, in the absence of data we preferred to overestimate upper thermal limits and underestimate lower thermal limits rather than vice versa. Transmission potential (relative R0 from the full R0 model) peaked at 26.4°C, and was positive from 17.0–31.5°C (Figure 3). Removing the temperature-dependence of mosquito density [M] did not substantially affect the peak, because the optima for transmission and mosquito density were closely aligned (constant M model: 26.6°C, M: 26.2°C). By contrast, the range of temperatures suitable for transmission is much larger when mosquito density does not depend on temperature because M(T) constrains transmission at the thermal limits (constant M model positive from 12.9–33.7°C). The thermal constraints that mosquito density imposes on transmission are important because, although demographic traits are well-known to vary with temperature in the laboratory, many temperature-dependent transmission models do not assume that temperature influences mosquito density (Martens et al., 1997; Craig et al., 1999; Paull et al., 2017; Caminade et al., 2017; Hamlet et al., 2018, but see Parham and Michael, 2009; Mordecai et al., 2013, Mordecai et al., 2017; Johnson et al., 2015). The moderate optimal temperature for RRV (26–27°C) fits within the range of thermal optima found for other diseases: malaria transmission by Anopheles spp. at 25°C, and dengue and other viruses by Ae. aegypti and Ae. albopictus at 29 and 26°C, respectively (Figure 4) (Mordecai et al., 2013; Mordecai et al., 2017). 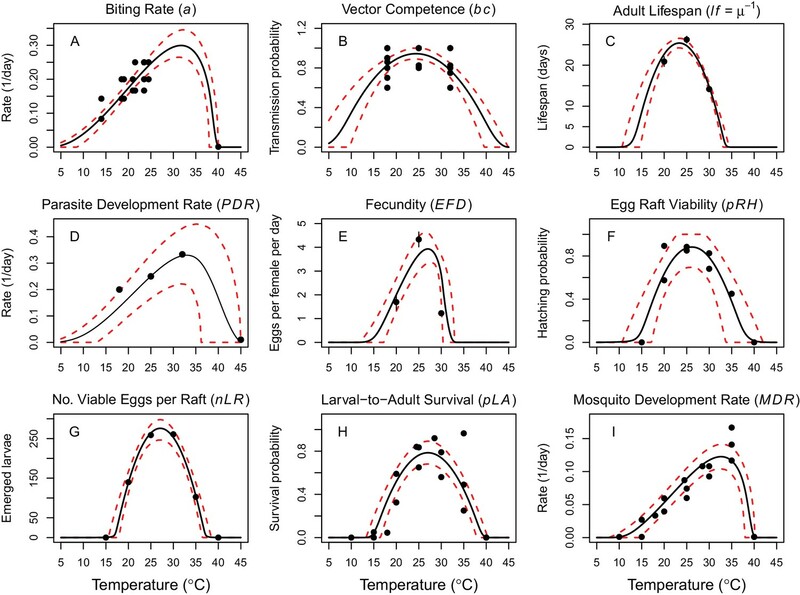 At the upper thermal limit fecundity (EFD) and adult lifespan (lf) constrain R0, while at the lower thermal limit fecundity, larval survival (pLA), egg survival (raft viability [pRH] and survival within rafts [nLR]), and adult lifespan constrain R0 (Figure 3—figure supplement 2). All of these traits (except adult lifespan) only occur in, and adult lifespan is quantitatively more important in, the full R0 model, illustrating the importance of incorporating effects of temperature on vector life history. Correspondingly, uncertainty in these traits generated the most uncertainty in R0 at the respective thermal limits (Figure 3—figure supplement 2C). The optimal temperature for R0 was most sensitive to the thermal response of adult lifespan. Near the optimum, most uncertainty in R0 was due to uncertainty in the thermal responses of biting rate and egg raft viability. For comparison, substituting larval traits from alternative vectors or infection traits for Murray Valley Encephalitis virus did not substantially alter the R0 thermal response, since Cx. annulirostris life history traits strongly constrained transmission (Figure 3—figure supplement 1). Temperature suitability for RRV transmission varies seasonally across Australia, based on the full R0 model (Equation 1) using monthly mean temperatures from WorldClim. In subtropical and temperate locations (Brisbane and further south), low temperatures force R0 to zero for part of the year (Figures 5A and 6). Monthly mean temperatures in these areas fall along the increasing portion of the R0 curve for the entire year, so thermal suitability for transmission increases with temperature. By contrast, in tropical, northern Australia (Darwin and Cairns), the temperature remains suitable throughout the year (Figures 5 and 6). Darwin is the only major city where mean temperatures exceed the thermal optimum, and thereby depress transmission. Because most Australians live in southern, temperate areas, country-scale transmission is strongly seasonal. 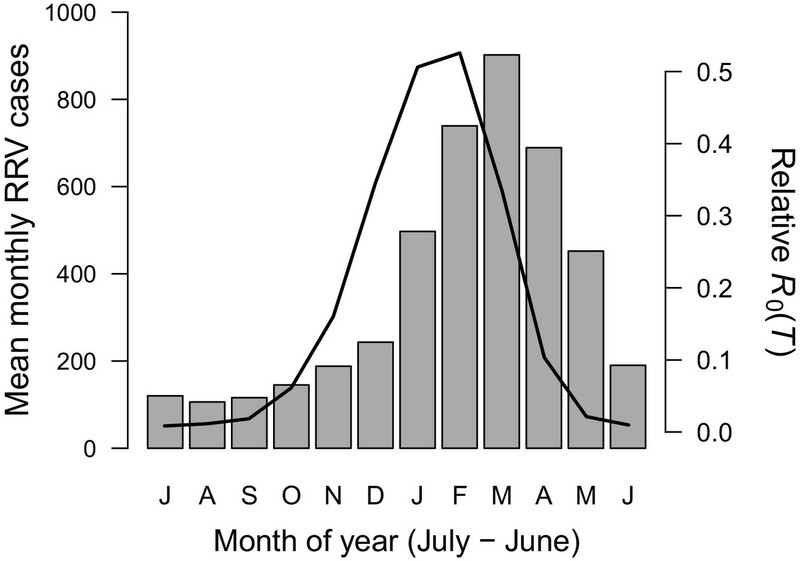 Using the average (1992–2013) seasonal incidence at the national scale, human cases peak two months after population-weighted R0(T), matching our a priori hypothesized time lag between temperature suitability and human cases (based on empirical work in other mosquito-borne disease systems, see Materials and methods and Discussion; Figure 7). As the climate warms, it is critical to understand effects of temperature on transmission of mosquito-borne disease, particularly as new mosquito-borne pathogens emerge and spread worldwide. Identifying transmission optima and limits by characterizing nonlinear thermal responses, rather than simply assuming that transmission increases with temperature, can more accurately predict geographic, seasonal, and interannual variation in disease. Thermal responses vary substantially among diseases and vector species (Mordecai et al., 2013; Mordecai et al., 2017; Tesla et al., in press), yet we lack mechanistic models based on empirical, unimodal thermal responses for many diseases and vectors. Here, we parameterized a temperature-dependent model for transmission of RRV (Figure 2) with data from two important vector species (Cx. annulirostris and Ae. vigilax; Figure 1). The optimal temperature for transmission is moderate (26–27°C; Figure 3), and largely determined by the thermal response of adult mosquito lifespan (Figure 3—figure supplement 2). Both low and high temperatures limit transmission due to low mosquito fecundity and survival at all life stages—thermal responses that are often ignored in transmission models (Figure 3—figure supplement 2). Temperature explains the geography of year-round endemic versus seasonally epidemic disease (Figures 5 and 6) and accurately predicts the seasonality of human cases at the national scale (Figure 7). Thus, the model for RRV transmission provides a mechanistic link between geographic and seasonal variation in temperature and broad-scale patterns of disease. While the thermal response of RRV transmission generally matched those of other mosquito-borne pathogens, there were some key differences. 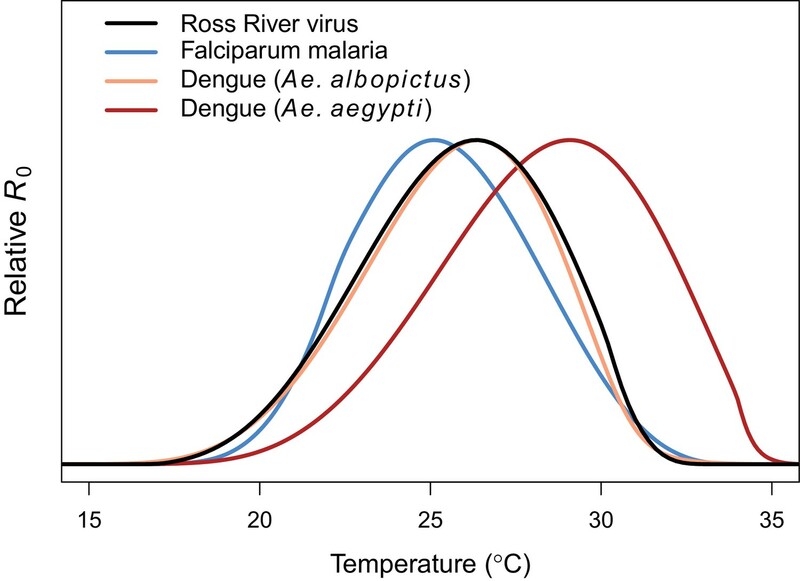 The moderate optimal temperature for RRV (26–27°C) fit within the range of thermal optima found for other diseases using the same methods: malaria transmission by Anopheles spp. at 25°C, and dengue and other viruses by Ae. aegypti and Ae. albopictus at 29 and 26°C, respectively (Figure 4) (Mordecai et al., 2013; Mordecai et al., 2017). For all of these diseases, the specific optimal temperature was largely determined by the thermal response of adult lifespan (Mordecai et al., 2013,;Mordecai et al., 2017; Johnson et al., 2015). However, the traits that set the thermal limits for RRV transmission differed from other systems. The lower thermal limit for RRV was constrained by fecundity and survival at all stages, while the upper thermal limit was constrained by fecundity and adult lifespan. By contrast, thermal limits for malaria transmission were set by parasite development rate at cool temperatures and egg-to-adulthood survival at high temperatures (Mordecai et al., 2013). As with previous models, the upper and lower thermal limits of RRV transmission are more uncertain than the optimum (Figure 3) (Johnson et al., 2015; Mordecai et al., 2017), because trait responses are harder to measure near their thermal limits where survival is low and development is slow or incomplete. Overall, our results support a general pattern of intermediate thermal optima for transmission where the well-resolved optimal temperature is driven by adult mosquito lifespan, but upper and lower thermal limits are more uncertain and may be determined by unique traits for different vector–pathogen systems. Additionally, upper thermal limits of mosquito-borne disease transmission (a major concern for climate change) are primarily determined by vector life history traits with symmetrical thermal performance curves (like fecundity and survival at various life stages) rather than rate-based traits with asymmetrical thermal performance curves (like biting rate or pathogen development rate). The trait thermal response data were limited in two keys ways. First, two traits (fecundity and adult lifespan) had data from only three temperatures. We used priors derived from data from other mosquito species to minimize over-fitting and better represent the true uncertainty (Figure 2, versus uniform priors in Figure 2—figure supplement 1). However, data from more temperatures would increase our confidence in the fitted thermal responses. Second, no vector species had data for all traits (Figure 1), so we combined mosquito traits from Cx. annulirostris and pathogen infection traits in Ae. vigilax to build composite relative R0 models. Geographic and seasonal variation in vector populations suggests that Ae. camptorhynchus and Ae. vigilax have different thermal niches (cooler and warmer, respectively) and Cx. annulirostris has a broader thermal niche (Figure 1) (Russell, 1998). We need temperature-dependent trait data for more species to test the hypothesis that these niche differences reflect the species’ thermal responses. If true, the current model, parameterized primarily with Cx. annulirostris trait responses, may not accurately predict the thermal responses of transmission by Ae. camptorhynchus and Ae. vigilax. Hypothesized species differences in thermal niche could explain why RRV persists over a wide climatic and latitudinal gradient. Thus, thermal response experiments with other RRV vectors are a critical area for future research. The temperature-dependent R0 model provides a mechanistic explanation for independently-observed patterns of RRV transmission across Australia. As predicted by the model (Figures 5 and 6), RRV is endemic in tropical Australia, with little seasonal variation in transmission potential due to temperature, and seasonally epidemic in subtropical and temperate Australia (Weinstein, 1997). The model also accurately predicts disease seasonality at the national scale (Figure 7), reproducing the a priori predicted lag (8–10 weeks, or 2 months) for temperature to affect reported human cases (Hu et al., 2006; Jacups et al., 2008b; Stewart Ibarra et al., 2013; Mordecai et al., 2017). This lag between temperature and reported human cases arises from the time it takes for mosquito populations to increase, bite humans and reservoir hosts, acquire RRV, become infectious, and bite subsequent hosts; for pathogens to incubate with vectors; for humans to potentially develop symptoms, seek treatment, and report cases. Further, RRV transmission by Cx. annulirostris in inland areas often moves south as temperatures increase from spring into summer (Russell, 1998), matching the model prediction (Figure 6). Although temperature is often invoked as a potential driver for these types of patterns, it is difficult to establish causality from statistical inference alone, particularly if temperature and disease both exhibit strong seasonality and could both be responding to another latent driver. Thus, the mechanistic model is a critical piece of evidence linking temperature to patterns of disease. In addition to explaining broad-scale patterns, the unimodal thermal model explains previously contradictory local-scale results. Specifically, statistical evidence for temperature impacts on local time series of cases is mixed. RRV incidence is often—but not always—positively associated with warmer temperatures (Tong and Hu, 2001; Tong et al., 2002a; Tong et al., 2004; Hu et al., 2004; Hu et al., 2010; Jacups et al., 2008b, Williams et al., 2009; Werner et al., 2012; Koolhof et al., 2017). However, variation in the effects of temperature on transmission across space and time is expected from an intermediate thermal optimum, especially when observed temperatures are near or varying around the optimum. The strongest statistical signal of temperature on disease is expected in temperate regions where mean temperature varies along the rapidly rising portion of the R0 curve (~20–25°C). If mean temperatures vary both above and below the optimum (as in Darwin), important effects of temperature may be masked in time series models that fit linear responses. Additionally, if temperatures are always relatively suitable (as in tropical climates) or unsuitable (as in very cool temperate climates), variation in disease may be due primarily to other factors. A nonlinear mechanistic model is critical for estimating temperature impacts on transmission because the effect of increasing temperature by a few degrees can have a positive, negligible, or negative impact on R0 along different parts of the thermal response curve. Although field-based evidence for unimodal thermal responses in vector-borne disease is rare (but see Mordecai et al., 2013; Perkins et al., 2015; Peña-García et al., 2017), there is some evidence for high temperatures constraining RRV transmission and vector populations: outbreaks were less likely with more days above 35°C in part of Queensland (Gatton et al., 2005) and populations of Cx. annulirostris peaked at 25°C and declined above 32°C in Victoria (Dhileepan, 1996). Future statistical analyses of RRV cases may benefit from using a nonlinear function for temperature-dependent R0 as a predictor instead of raw temperature (Figure 6B versus Figure 6A). Breeding habitat availability also drives mosquito abundance and mosquito-borne disease. Local rainfall or river flow have been linked to the abundance of RRV vector species (Barton et al., 2004; Tall et al., 2014; Jacups et al., 2015) and RRV disease cases (Tong and Hu, 2001; Tong et al., 2002a; Hu et al., 2004; Kelly-Hope et al., 2004b; Tong et al., 2004; Gatton et al., 2005; Jacups et al., 2008b; Bi et al., 2009; Williams et al., 2009; Werner et al., 2012), as have high tides in coastal areas with saltmarsh mosquitoes, Ae. vigilax and Ae. camptorhynchus (Tong and Hu, 2002b; Tong et al., 2004; Jacups et al., 2008b; Kokkinn et al., 2009). Overlaying models of species-specific breeding habitat with temperature-dependent models will better resolve the geographic and seasonal distribution of RRV transmission. Relative R0 peaked at similar temperatures whether or not we assumed mosquito abundance was temperature-dependent (Equation 1 versus Equation 2); however, the range of suitable temperatures was much wider for the model that assumed a temperature-independent mosquito population (Figure 3). Since breeding habitat can only impact vector populations when temperatures do not exclude them, it is critical to consider thermal constraints on mosquito abundance, even when breeding habitat is considered a stronger driver. Nonetheless, many mechanistic, temperature-dependent models of vector-borne disease transmission do not include thermal effects on vector density (Martens et al., 1997; Craig et al., 1999; Paull et al., 2017; Caminade et al., 2017; Hamlet et al., 2018). Our results demonstrate that the decision to exclude these relationships can have a critical impact on model results, especially near thermal limits. Several important gaps remain in our understanding of RRV thermal ecology, in addition to the need for trait thermal response data for more vector species. First, the relative R0 model needs to be more rigorously validated using time series of cases to determine the importance of temperature at finer spatiotemporal scales. These analyses should incorporate daily, seasonal, and spatial temperature variation, including aquatic larval habitat and adult microhabitat temperatures (Paaijmans et al., 2010; Cator et al., 2013; Carrington et al., 2013; Thomas et al., 2018). They should also integrate species-specific drivers of breeding habitat availability, like rainfall and tidal patterns, infrastructure (e.g. drainage), and human activities (e.g. deliberate and accidental water storage). Second, translating environmental suitability for transmission into human cases also depends on disease dynamics in reservoir host populations and their impact on immunity. For instance, in Western Australia heavy summer rains can fail to initiate epidemics when low rainfall in the preceding winter depresses recruitment of susceptible juvenile kangaroos (Mackenzie et al., 2000). By contrast, large outbreaks occur in southeastern Australia when high rainfall follows a dry year, presumably from higher transmission within relatively unexposed reservoir populations (Woodruff et al., 2002). Third, as the climate changes, long-term predictions should consider potential thermal adaption of vectors, since transmission at upper thermal limits is currently limited by vector life history traits. To date, we know very little about standing genetic variation for thermal performance or existing local thermal adaptation in vectors for any disease system. Building vector species-specific R0 models and integrating thermal ecology with other drivers are important next steps for forecasting variation in RRV transmission. These more advanced models are necessary to translate our relative R0 results into predictions of absolute R0 (i.e. estimating the secondary cases per primary case, and where and when R0 >1 for sustained transmission). Nonlinear thermal responses are particularly important for predicting how transmission will change under future climate regimes. Climate warming will likely increase the geographic and seasonal range of transmission potential in temperate, southern Australia where most Australians live. However, climate change will likely decrease transmission potential in tropical areas like Darwin, where moderate warming (~3°C) would push temperatures above the upper thermal limit for transmission for most of the year (Figure 5). However, the extent of climate-driven declines in transmission will depend on how much Cx. annulirostris and Ae. vigilax can adapt to extend their upper thermal limits and whether warmer-adapted vector species (e.g. Ae. aegypti and potentially Ae. polynesiensis) can invade and sustain RRV transmission cycles. Thus, we can predict the response of RRV transmission by current vector species to climate change based on these trait thermal responses. However, future disease dynamics will also depend on vector adaptation, potential vector species invasions, and climate change impacts on sea level and precipitation that drive vector habitat availability. 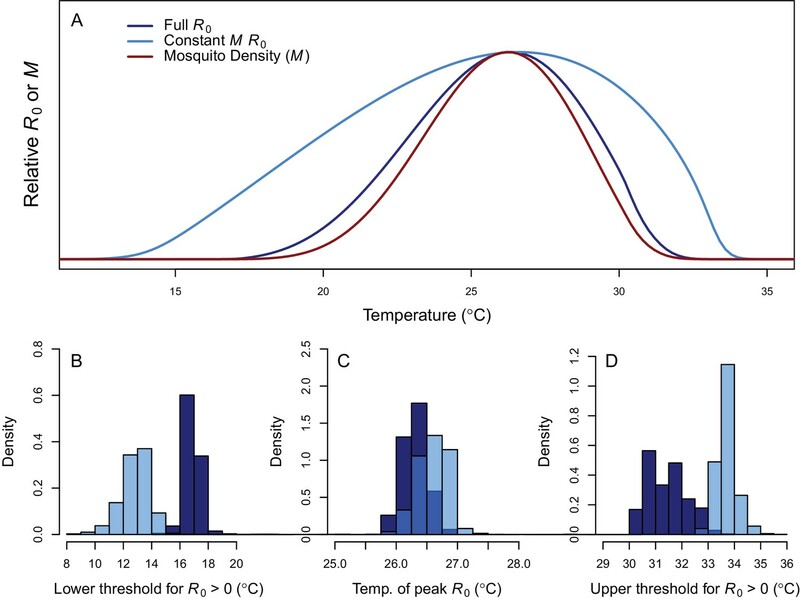 The ‘full R0 model’ (Equation 1) assumes temperature drives mosquito density and includes vector life history trait thermal responses (Parham and Michael, 2009; Mordecai et al., 2013; Mordecai et al., 2017). The ‘constant M model’ (Equation 2) assumes mosquito density (M) does not depend on temperature (Dietz, 1993). There is disagreement in the literature over whether the equation for R0 should contain the square root (Dietz, 1993; Heffernan et al., 2005; Smith et al., 2012). We use the version derived from the next-generation matrix method (Dietz, 1993) in order to be consistent with our previous work in other mosquito-borne disease systems (Mordecai et al., 2013; Mordecai et al., 2017; Johnson et al., 2015). In both equations, (T) indicates that a parameter depends on temperature, a is mosquito biting rate, bc is vector competence (proportion of mosquitoes becoming infectious post-exposure), µ is adult mosquito mortality rate (adult lifespan, lf = 1/µ), PDR is parasite development rate (PDR = 1/EIP, the extrinsic incubation period), N is human density, and r is the recovery rate at which humans become immune (all rates are measured in days−1). The latter two terms do not depend on temperature. In the full R0 model, mosquito density (M) depends on fecundity (EFD, eggs per female per day), proportion surviving from egg-to-adulthood (pEA), and mosquito development rate (MDR), divided by the square of adult mortality rate (µ) (Parham and Michael, 2009). We calculated pEA as the product of the proportion of egg rafts that hatch (pRH), the number of larvae per raft (nLR, scaled by the maximum at any temperature to calculate proportional egg survival within-rafts), and the proportion of larvae surviving to adulthood (pLA). We digitized previously published trait data (Figure 2—figure supplement 1; McDonald et al., 1980; Mottram et al., 1986; Russell, 1986; Rae, 1990; Kay and Jennings, 2002) using the free web-based tool Webplot Digitizer available at: https://automeris.io/WebPlotDigitizer/. We fit thermal responses of each trait using Bayesian inference with the ‘r2jags’ package (Plummer, 2003; Su and Yajima, 2009) in R (R Core Team, 2017). Traits with asymmetrical thermal responses were fit as Brière functions: qT(T–Tmin)(Tmax–T)1/2 (Briere et al., 1999). Traits with symmetrical thermal responses were fit as quadratic functions: -q(T–Tmin)(T–Tmax). In both functions of temperature (T), Tmin and Tmax are the critical thermal minimum and maximum, respectively, and q is a rate parameter. For priors we used gamma distributions with hyperparameters derived from thermal responses fit to data from other mosquito species (Figure 2—source data 2) (Davis, 1932; Jalil, 1972; McLean et al., 1974; Watts et al., 1987; Rueda et al., 1990; Focks et al., 1993; Joshi, 1996; Teng and Apperson, 2000; Tun-Lin et al., 2000; Alto and Juliano, 2001; Briegel and Timmermann, 2001; Kamimura et al., 2002; Calado and Navarro-Silva, 2002; Focks and Barrera, 2006; Wiwatanaratanabutr and Kittayapong, 2006; Lardeux et al., 2008; Delatte et al., 2009; Beserra et al., 2009; Yang et al., 2009; Westbrook et al., 2010; Muturi et al., 2011; Carrington et al., 2013; Tjaden et al., 2013; Eisen et al., 2014; Xiao et al., 2014; Ezeakacha, 2015; Morin et al., 2015). These priors allowed us to more accurately represent the fit and uncertainty. Our data did not include declining trait values at high temperatures for biting rate (a) and parasite development rate (PDR). Nonetheless, data from other mosquito species (Mordecai et al., 2013; Mordecai et al., 2017) and principles of thermal biology (Dell et al., 2011) imply these traits must decline at high temperatures. Thus, for those traits we included an artificial data point where the trait value approached zero at a very high temperature (40°C), allowing us to fit the Brière function. We used strongly informative priors to limit the effect of these traits on the upper thermal limit of R0 (by constraining them to decline near 40°C). Because our approach is designed to identify which traits constrain transmission at thermal limits, this choice is conservative by allowing R0 to be limited by other traits with better data. Accordingly, in the absence of data we favored overestimating Tmax and underestimating Tmin over the alternative. For comparison, we also fit all thermal responses with uniform priors (Figure 2—figure supplement 1); these results illustrate how the priors affected the results. Bayesian inference produces estimated posterior distributions rather than a single estimated value. Because these distributions can be non-normal and asymmetric, we report and apply medians rather than means, since medians are less sensitive to outlying values in extended tails. However, we plot mean values in the figures because they show a smoother and more visually intuitive representation of where trait and R0 thermal responses go to zero at the upper thermal limit. The means and medians are not substantially different, except at this thermal limit (see example in Figure 3—figure supplement 3). We conducted sensitivity and uncertainty analyses of the full R0 model (Equation 1) to understand how trait thermal responses shape the thermal response of R0. We examined the sensitivity of R0 two ways. First, we evaluated the impact of each trait by setting it constant while allowing all other traits to vary with temperature. Second, we calculated the partial derivative of R0 with respect to each trait across temperature (∂R0/∂X · ∂X/∂T for trait X and temperature T; Equations 3-6). To understand what data would most improve the model, we also calculated the proportion of total uncertainty in R0 due to each trait across temperature. First, we propagated posterior samples from all trait thermal response distributions through to R0(T) and calculated the width of the 95% highest posterior density interval (HPD interval; a type of credible interval) of this distribution at each temperature: the ‘full R0(T) uncertainty’. Next, we sampled each trait from its posterior distribution while setting all other trait thermal responses to their posterior medians, and calculated the posterior distribution of R0(T) and the width of its 95% HPD interval across temperature: the ‘single-trait R0(T) uncertainty’. Finally, we divided each single-trait R0(T) uncertainty by the full R0(T) uncertainty. The partial derivatives are given below for all traits (x) that appear only once in the numerator of R0 (bc, EFD, pRH, nLR, pLA, MDR; Equation 3), biting rate (a, Equation 4), parasite development rate (PDR, Equation 5), and lifespan (lf, Equation 6). 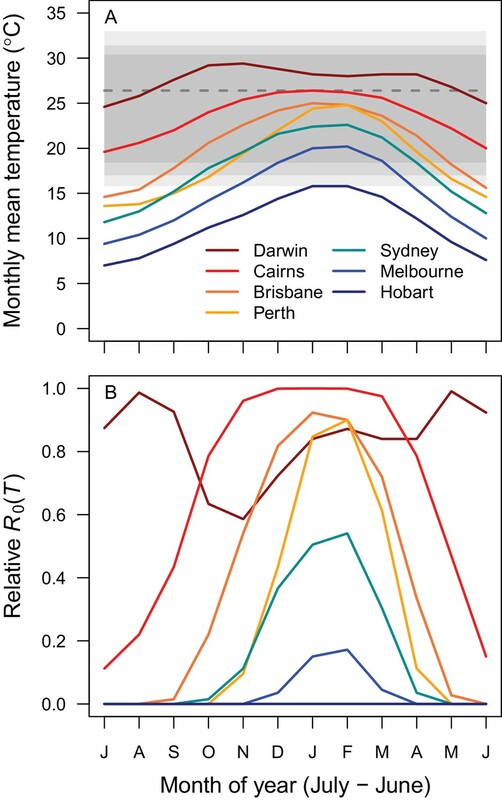 We took monthly mean temperatures from WorldClim for seven cities spanning a latitudinal and temperature gradient (from tropical North to temperate South: Darwin, Cairns, Brisbane, Perth, Sydney, Melbourne, and Hobart) and calculated the posterior median R0(T) for each month at each location. We also compared the seasonality of a population-weighted R0(T) and nationally aggregated RRV cases. We used 2016 estimates for the fifteen most populous urban areas, which together contain 76.6% of Australia’s population (Australian Bureau of Statistics, 2017). We calculated R0(T) for each location (as above) and estimated a population-weighted average. We compared this country-scale estimate of R0(T) with data on mean monthly human cases of RRV nationwide from 1992 to 2013 obtained from the National Notifiable Diseases Surveillance System. We expected a time lag between temperature and reported human cases as mosquito populations increase, bite humans and reservoir hosts, acquire RRV, become infectious, and bite subsequent hosts; after an incubation period, hosts (potentially) become symptomatic, seek treatment, and report cases. Empirical work on dengue vectors in Ecuador identified a six-week time lag between temperature and mosquito oviposition (Stewart Ibarra et al., 2013). Subsequent mosquito development and incubation periods in mosquitoes and humans likely add another 2–4 week lag before cases appear, resulting in an 8–10 week lag between temperature and observed cases (Hu et al., 2006; Jacups et al., 2008b; Mordecai et al., 2017). With monthly case data, we hypothesize a two-month time lag between R0(T) and RRV disease cases. To illustrate temperature suitability for RRV transmission across Australia, we mapped the number of months for which relative R0(T) >0 and >0.5 for the posterior median, 2.5 and 97.5% credibility bounds (Figure 5—figure supplement 1) for the full R0 model (Equation 1). We calculated R0(T) at 0.2°C increments and projected it onto the landscape for monthly mean temperatures from WorldClim data at a 5 min resolution (approximately 10 km2 at the equator). Climate data layers were extracted for the geographic area, defined using the Global Administrative Boundaries Databases (GADM, 2012). We performed map calculations and manipulations in R with packages ‘raster’ (Hijmans, 2016), ‘maptools’ (Bivand and Lewin-Koh, 2017), and ‘Rgdal’ (Bivand et al., 2017), and rendered GeoTiffs in ArcGIS version 10.3.1. In 2000 there was a proposed shift in mosquito taxonomy: several subgenera within the genus Aedes were elevated to genus status (Wilkerson et al., 2015). This change affected Aedes vigilax and Aedes camptorhynchus, which were called Ochlerotataus vigilax and Ochlerotatus camptorhynchus for a time by some researchers. More recently, there has been a consensus to return to the previous naming system, so we use Aedes here, although many of the papers we cite use Ochlerotatus instead. The fecundity and adult survival data in McDonald et al. (1980) were published as time series of one experimental population at each temperature. The resulting data needed to be transformed to fit the corresponding trait thermal responses. For survival, McDonald et al. reported the percent surviving approximately every other day (hereafter: ‘semi-daily’). We used these data—along with the number of female adults alive on the first day of oviposition at each temperature—to generate a semi-daily time series estimating the number surviving. To generate the dataset that we used to directly fit the thermal responses, we converted this time series into the number of female individuals who died on each day (i.e. lifespan data). For fecundity, McDonald et al. reported semi-daily fecundity data for entire population. Because the population was synchronized, and because mosquitoes lay discrete clutches of eggs separated by several days (the gonotrophic cycle duration), there were many data points when the populations did not produce offspring. These zero-inflated fecundity data are not ideal for fitting thermal responses. Therefore, after digitizing the semi-daily fecundity time series, we binned periods of several days (the bin size varied by temperature, since the gonotrophic cycle duration varies with temperature) and took a survival-weighted average within each bin (so days with more individual mothers contributing to offspring production counted more). To generate the dataset that we used to directly fit the thermal responses, we weighted the values within each bin by the mean number of surviving mothers in that bin. This approach allowed us to more accurately reflect daily fecundity averaged over a non-synchronized mosquito population. Note that the variation captured by these data and this approach is not variation between individual adult females, but rather variation by age for the whole population. Journal of Medical Entomology 38:548–556. Australian Journal of Entomology 43:16–22. The Proceedings of the Linnean Society of New South Wales 126:261–267. Australian Journal of Soil Research 46:62–66. Rgdal: bindings for the “Geospatial” Data Abstraction Library, https://cran.r-project.org/package=rgdal. Maptools: tools for reading and handling spatial objeccts, https://cran.r-project.org/package=maptools. Journal of Medical Entomology 38:566–571. New South Wales Public Health Bulletin 11:132–134. Revista Brasileira De Entomologia 46:93–98. Arbovirus Research in Australia 5:24–28. PLoS Neglected Tropical Diseases 7:e2190. Vector-Borne and Zoonotic Diseases 9:611–622. The Journal of Applied Ecology 18:373–399. American Journal of Epidemiology 16:163–176. Journal of Medical Entomology 46:33–41. Medical and Veterinary Entomology 10:375–384. Statistical Methods in Medical Research 2:23–41. Journal of Medical Entomology 51:496–516. Journal of Medical Entomology 30:1003–1017. 92–109, Dengue transmission dynamics: assessment and implications for control, Report of the Scientific Working Group Meeting on Dengue, Geneva, WHO. Journal of Medical Entomology 41:115–120. GADM database of Global Administrative Boundaries, 2.0, http://www.gadm.org. The American Journal of Tropical Medicine and Hygiene 72:792–799. PLoS Neglected Tropical Diseases 12:e0006284. The American Journal of Tropical Medicine and Hygiene 62:561–565. Journal of The Royal Society Interface 2:281–293. Raster: geographic data analysis and modeling, https://cran.r-project.org/package=raster. The American Journal of Tropical Medicine and Hygiene, 71, 15306700. Journal of Medical Entomology 43:375–381. The American Journal of Tropical Medicine and Hygiene 83:722–728. Vector-Borne and Zoonotic Diseases 8:283–298. Tropical Medicine & International Health 13:943–952. Journal of Vector Ecology 40:277–281. Journal of Economic Entomology 65:625–626. Journal of Thermal Biology 21:151–154. Medical Entomology and Zoology 53:53–58. Medical and Veterinary Entomology 3:107–112. Journal of Medical Entomology 39:99–105. Journal of Medical Entomology 41:1116–1122. Journal of Medical Entomology 41:133–150. Medical and Veterinary Entomology 23:85–91. International Journal of Infectious Diseases 57:73–76. The American Journal of Tropical Medicine and Hygiene 49:686–696. Arbovirus Research in Australia 6:72–76. Australian Journal of Entomology 46:60–64. Australian Journal of Ecology 5:379–384. New South Wales Public Health Bulletin 5:98–99. Canadian Journal of Microbiology 20:255–262. Arbovirus Research in Australia 6:68–72. PLoS Neglected Tropical Diseases 11:e0005568. PLoS Neglected Tropical Diseases 9:e0004002. Australian Journal of Entomology 25:131–136. Journal of Medical Entomology 48:243–250. Proceedings of the Royal Society B: Biological Sciences 284:20162078. Annals of Global Health 83:509–518. Journal of Medical Entomology 27:756–762. Journal of Medical Entomology 34:156–159. The American Journal of Tropical Medicine and Hygiene 30:1294–1302. Journal of Medical Entomology 27:892–898. Australian Journal of Entomology 25:103–109. Journal of Medical Entomology 28:796–804. Bulletin of the Society of Vector Ecologists 19:73–81. International Journal for Parasitology 28:955–969. Journal of Medical Entomology 37:146–152. Journal of the American Mosquito Control Association 24:319–322. Proceedings of the Royal Society B: Biological Sciences 282:20151383. The American Journal of Tropical Medicine and Hygiene 88:971–981. R2jags: A Package for Running Jags From R.
Journal of Medical Entomology 51:1097–1108. Journal of Medical Entomology 37:40–52. PLoS Neglected Tropical Diseases 7:e2207. Journal of Epidemiology & Community Health 56:617–621. Occupational and Environmental Medicine 59:739–744. Tropical Medicine and International Health 9:298–304. Medical and Veterinary Entomology 14:31–37. The American Journal of Tropical Medicine and Hygiene 36:143–152. Vector-Borne and Zoonotic Diseases 10:241–247. Arbovirus Research in Australia 6:266–270. The Northern Territory Communicable Disease Bulletin 2:9–11. Arbovirus Research in Australia 7:337–345. Australian and New Zealand Journal of Public Health 33:284–288. Australian Journal of Entomology 50:195–199. Medical and Veterinary Entomology 20:300–307. Thank you for submitting your article "Temperature explains broad patterns of Ross River virus transmission" for consideration by eLife. Your article has been reviewed by two peer reviewers, and the evaluation has been overseen by a Reviewing Editor and Ian Baldwin as the Senior Editor. The reviewers have opted to remain anonymous. Another very nice manuscript by Mordecai and colleagues. Their approach has worked successfully for better understanding malaria, dengue and Zika and chikungunya transmission, and is now applied to another yet underappreciated infectious disease: Ross River virus (with a focus on Australia). 1) The authors highlight on various occasions that there is quite a bit of uncertainty in the data, given that good reliable experimental data are scarce. One way of solving the uncertainly at the high temperature end is to use the so-called ectotherm physiology theory, which implies traits must decline at very high temperature (40°C). However, looking at Figure 2 the data for the various traits do not seem to match (biologically). For example, adults do not survive at temperatures of 34°C and beyond. Yet, at these very same temperatures they continue to bite. Should those traits not be capped at the same temperature as well (34°C)? Same at lower temperature extreme. Or perhaps it is the other way round: lifespan is 0 days at 40°C? 2) Mean monthly temperatures are used to create the suitability maps, but how well do these temperatures represent the various vector breeding habitats and available adult mosquito resting sites? 3) Just wondering: looking at your PDR curve and your mosquito curves, do you hypothesize that the virus is already prepared for climate change, and that the limiting factor or bottleneck is the mosquito at moment? If true, subtle differences in the upper limit (and/or the ability to adapt) between mosquito species may become important. 4) The comparison of the results to data on seasonality is welcome but lacks two key components. First, the authors do not describe how the timing of the RRV peak corresponds to that of the model-based estimates. They state 'as hypothesized', but do not relate this hypothesis which is critical to the results. They also characterize this finding as 'matching […] the seasonal peak' in the Abstract, which is not explicitly the case because there is a delay. Second, The authors only make a single comparison despite having a data on multiple outbreaks in multiple parts of the country and highlighting their region specific estimates. The density model for Australia is spatiotemporal should it should be analyzed against spatiotemporal data (e.g. Discussion, fourth paragraph), not just summarized temporal data. 5) The way the mosquito species are combined in the final model is unclear, e.g. Figure 5. Some data were available from different species and were used in different combinations for different components, but I could not tell which ones entered the final model or why that is expected to be a reasonable model despite the differences between species which the authors highlight at multiple points (e.g. Discussion, last paragraph). Uncertainty around this is compounded by the limited validation (i.e. comment above). 6) The Discussion should include limitations of the utility of the results due to estimating 'relative R0' as opposed to R0. 7) The authors included a square root in the R0 calculation which changes its traditional meaning. It's not clear why they have made this modification and it probably has little if any impact on the results. Nonetheless, it would be best to use the traditional equation to reduce confusion in the literature. However, looking at Figure 2 the data for the various traits do not seem to match (biologically). For example, adults do not survive at temperatures of 34°C and beyond. Yet, at these very same temperatures they continue to bite. Should those traits not be capped at the same tempertaure as well (34°C)? Same at lower temperature extreme. Or perhaps it is the other way round: lifespan is 0 days at 40°C? The reviewers are correct identifying this apparent contradiction. Because it is difficult to measure traits at biologically extreme temperatures where survival and organismal performance are low, the shape of thermal performance curves at lower and upper thermal limits is always somewhat uncertain. To ensure that our models were not artificially constrained by assumptions about trait performance at temperatures for which they were not measured, we conservatively forced these traits to zero only at the extreme temperature of 40°C. In the R0 model, transmission is constrained by the traits with the most restrictive Tmin and Tmax. Therefore, the positive biting rate at temperatures where adult survival is zero does not result in any predicted transmission. Given the lack of biting rate data at higher temperatures, we did not want biting rate to artificially constrain transmission (i.e., in the absence of data it is much better to overestimate Tmax and underestimate Tmin than vice versa). Additionally, we consulted with our colleague Dr. Matthew Thomas (an empirical mosquito physiologist at Penn State) whose expert opinion (based on years of measuring thermal performance curves in mosquitoes) is that biting rate is the last trait to go to zero – if mosquitoes are alive, they will bite. He argues that biting rate will never constrain R0, and that models of transmission should reflect that. We revised the manuscript (in the Materials and methods and in the Results) to make the rationale behind our approach clearer. The reviewers are correct that water stores heat differently than air, and therefore larval habitat temperatures do not exactly match the surrounding air temperatures. (The discrepancy between air and water temperatures depends on the volume of the body of water.) Thermal consequences of adult mosquito microhabitat selection is an open area of research. However, our suitability maps are already so coarse in scale (monthly mean temperatures) that these differences are likely trivial compared to other sources of temperature variation that we also do not include (i.e., daily and weekly thermal variation). Nonetheless, our coarse-scale, constant-temperature analysis is an important and necessary first step before it is possible to incorporate finer-scale and varying temperature analyses. We added text (in the Discussion) to point out these additional sources of temperature variation as limitations on our results and important avenues for further study. The reviewers are correct. For almost all organisms, development rates peak at higher temperatures than other life history traits like survival and fecundity. Thus, these traits – and particularly adult lifespan – are the key limitation on disease transmission at high temperatures. Moreover, differences in the thermal response of lifespan between mosquito species are very important (e.g., Mordecai et al., 2017 predict a 3°C difference in the optimal temperature for dengue transmission by Ae. aegypti and Ae. albopictus that arises from differences in mosquito survival at high temperatures). As a result, any evolutionary response of mosquito lifespan to climate change will impact how climate change affects disease transmission. We revised the manuscript (in the Discussion) to better emphasize these points. 4) The comparison of the results to data on seasonality is welcome but lacks two key components. First, the authors do not describe how the timing of the RRV peak corresponds to that of the model-based estimates. They state 'as hypothesized', but do not relate this hypothesis which is critical to the results. They also characterize this finding as 'matching… the seasonal peak' in the Abstract, which is not explicitly the case because there is a delay. Second, The authors only make a single comparison despite having a data on multiple outbreaks in multiple parts of the country and highlighting their region specific estimates. The density model for Australia is spatiotemporal should it should be analyzed against spatiotemporal data (e.g. Discussion, fourth paragraph), not just summarized temporal data. The reviewers make an excellent point. Our model estimates the value of R0 at constant temperatures but does not simulate transmission dynamically in a population. Therefore, our model cannot directly predict when human cases should peak as temperature changes over time, since temporal lags are introduced based on the time it takes for mosquito abundance to increase, the virus to incubate in the vectors, transmission to new humans to occur, and for humans to present symptoms, seek healthcare, and have cases recorded. Our “predicted seasonality” is based on independent work in other systems showing that there is often a 6-week lag between temperature and mosquito population abundance, resulting in a 8-10 week lag between temperature and observed cases. Based on this predicted lag (2 months), the seasonality of human cases is consistent with our temperature-based R0 model. We agree that a spatiotemporal analysis is an important and obvious next step. However, we do not currently have multi-year or multi-location outbreak data. If we are able to obtain these data, we hope to accomplish this spatiotemporal analysis in a future paper. Although we do not have sufficient data to fully validate the temperature-dependent R0 model, the seasonal RRV data shows that our model is consistent with broad-scale observed patterns of disease. Validating this type of model (where the output is relative R0 that depends only on temperature) with human incidence data across time and space is non-trivial and there are no consensus methods for doing so. We are currently working on developing new methods to validate the model (with the spatiotemporal data described above that we hope to obtain). However, doing so is beyond the scope of this article. We have revised our description of the seasonality results to make the rationale for the expected two-month lag between peak R0 and peak cases clearer (in the Introduction, Results, and Discussion). We have added text to the manuscript (in the Results, and in various figure captions [Figure 2; Figure 5; Figure 6; Figure 7]) to be clearer about which species traits are incorporated into the main R0 model. As in Figure 2, mosquito-only traits are from Cx. annulirostris and infection traits are from Ae. vigilax. The trait fits from other vector and virus species (and the corresponding alternative R0 models) are only shown in supplemental figures for comparison with the main model. The main text R0 model is primarily constrained by Cx. annulirostris traits, and is a reasonable model for transmission by Cx. annulirostris because the temperature-dependence of vector transmission is largely driven by vector traits (Mordecai et al., 2013, 2017). For other mosquito species, including Ae. vigilax, demographic and infection rate traits are likely to vary, resulting in different relationships between R0 and temperature. A major aim of our research program and this paper is to rigorously and clearly identify what trait data from which vector species are available in the literature, and to highlight how that impacts our predictions for how disease transmission will respond to climate change. There is a common misconception that the relationships between vector and pathogen traits and temperature are already well-known, yet that is clearly not the case. For these reasons, we hope this work will motivate further empirical work on the thermal responses of other Australian vector species, an important research gap that we highlight in the Discussion. The reviewer raises a very important discussion point. Our major goals in this paper are to synthesize the multiple vector and parasite traits by which temperature influences transmission, to predict the overall response of transmission to temperature, and to identify the traits that drive both the response of transmission to temperature and the uncertainty in this response. To accomplish these goals, we needed a metric for transmission that incorporates the (nonlinear) influence of multiple traits, which can be parameterized with laboratory experiment data in which thermal responses can be measured rigorously. Relative R0 is an appropriate metric for this purpose because it incorporates the known temperature-dependent processes (and their nonlinear responses) involved in vector transmission. In this and previous papers, we have shown that relative R0 models parameterized in this way can accurately predict the temperature response of transmission in the field (Mordecai et al., 2013, 2017). However, our relative R0 metric differs from some traditional uses R0 as the number of secondary cases arising from a primary case in a fully susceptible population (i.e., the absolute reproductive number), and to calculate the critical vaccination threshold. This departure is intentional, because we do not expect temperature to be the only driver of variation in R0, nor do we expect laboratory experiments to capture quantitative transmission rates in the field. Instead, we are most interested in the relative effect of temperature on transmission potential, the optimal temperature for transmission, and the thermal limits at which transmission potential declines to zero. We now more fully describe this rationale (third and last paragraphs in the Introduction) and explicitly mention translating relative R0 into absolute R0 (seventh paragraph in the Discussion). We recognize that there are multiple forms of R0 commonly used in the literature, and that their meaning and derivation differ (Dietz 1993, Heffernan et al., 2005, Smith et al., 2012). As we explain in response 6, we are only using R0 to predict relative effects of temperature on transmission and to identify the thermal limits and optima. These metrics are not affected by whether our equation or its square is used because there is a monotonic, 1:1 relationship between the two forms (we previously demonstrated this in the supplementary materials of Mordecai et al., 2017, Figure F). The method we use here was derived from the next generation matrix method and is used in our previous analyses for malaria (Mordecai et al., 2013), dengue (Mordecai et al., 2017), and Zika (Tesla et al. bioRxiv, 2018). By keeping the model methods consistent, we facilitate comparison across systems. We have added text indicating that there is disagreement in the literature and providing our reasoning (subsection “Temperature-Dependent R0 Models”, first paragraph in the Materials and methods). We thank Leah Johnson and Matt Thomas for comments and Cameron Webb for posting the RRV case data (https://cameronwebb.wordpress.com/2014/04/09/why-is-mosquito-borne-disease-risk-greater-in-autumn/). All authors were supported by the National Science Foundation (DEB-1518681; https://nsf.gov/). EAM was supported by the NSF (DEB-1640780; https://nsf.gov/), the Stanford Woods Institute for the Environment (https://woods.stanford.edu/research/environmental-venture-projects), and the Stanford Center for Innovation in Global Health (http://globalhealth.stanford.edu/research/seed-grants.html). © 2018, Shocket et al. Listen to Martha Shocket talk about how temperature affects the Ross River virus. Climate change can have mixed effects on mosquito-borne diseases.